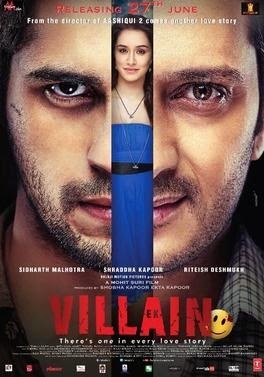 If awesome songs, meaningful lyrics, cute love story, beautiful heroine and handsome hero is all Indian soul expects from an Indian movie, then, Ek Villain gets full marks. The movie is about love, how love can transform you as well as your life. There are some really good moments in the film. But, generally, the screenplay is lousy and refuse to make a mark in your mind. The performance of the Siddharth and Shraddha is also not good enough. However, Riteish shines. He emerges as the hero with his subtlety. I am still trying to understand what Prachi Desai was trying to show; prove. All said, the movie is colorful and vibrant. The songs blends with the movie and renders soul. The way Guru (Siddharth) longs and loves Aisha (Shraddha) would make any woman crave for such a man in her life. In short, leave logic behind… Treat your ears and indulge! I just loved a few songs from this movie apart from the sad-and-silent look of a very dashing Siddarth!